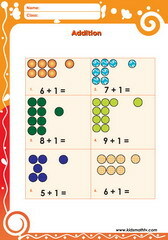 Addition of 1 to other numbers up to 6 with dots. 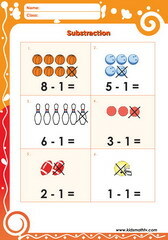 Adding single digit numbers e.g. 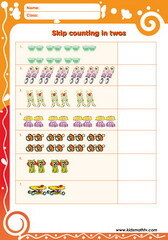 1 + 2, 3 + 4 etc worksheet. 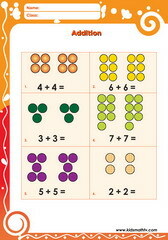 Adding doubles e.g. 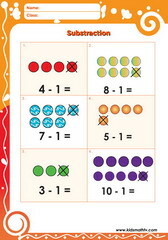 10 + 10, 7 + 7 etc let kids get extra practice on addition. 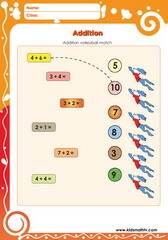 Addition match making entails adding & finding answers that match. 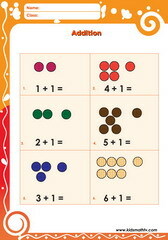 Math problems with pictures that reflect a given problem. 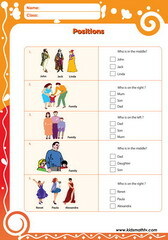 Make right choices. 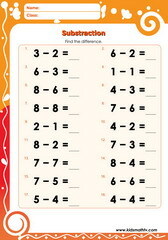 Addition shoe match worksheet entails matching the right answers. 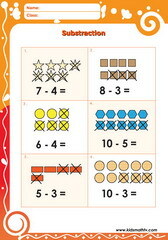 Learn addition of numbers up to ten e.g. 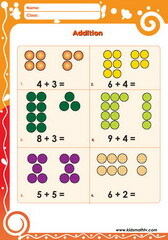 1 + 2, 3 + 4 etc. 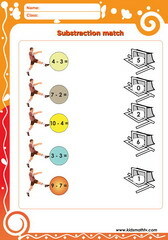 Addition volley ball game activity worksheet. 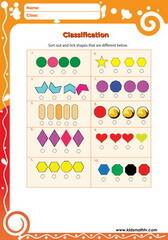 Classifying & sorting different shapes and objects in a mixed set. 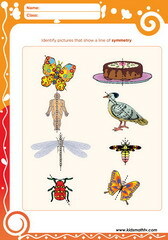 Identifying same but different object by virtue of size. 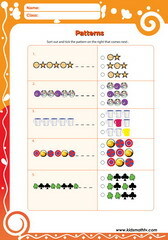 Classifying same objects in a mix of objects worksheet. 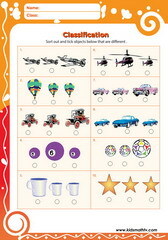 Comparing more vs few objects with pictures in this worksheet. 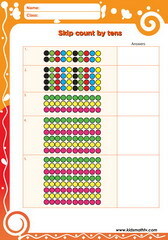 Compare numbers, greater than, less than from 1 to 20 . 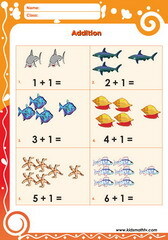 Comparisons big vs smaller with this worksheet. 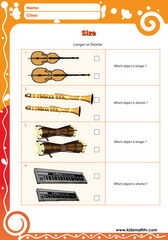 Comparisons in terms of long vs short objects. Identifying fractions worksheet, 1/2, 1/4, 1/5 etc. Learn how to make graphs with this activity sheet, count & plot. 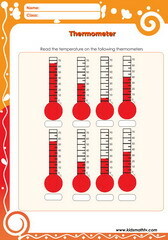 Reading a thermometer activity sheet - degrees Celsius . Practice recognizing money especially US coins, adding them etc. 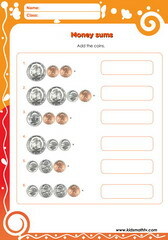 Adding & subtracting with money US dollar cents, sums, shopping etc. Find missing numbers on a number line from 0 to 10 . Number lines with numbers from 10 to 20 worksheet. 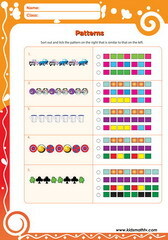 Learn about growing patterns : how they increase, progressions etc. 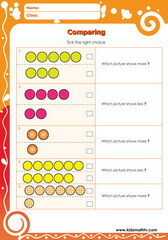 Identifying and observing similar patterns in math. 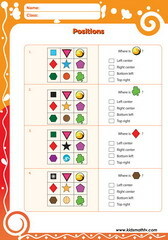 Print and exercise your skills. 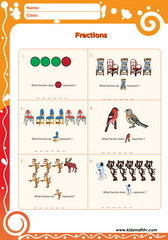 Spatial sense: Inside and outside positions worksheet for kinder. Left, right & middle positions of objects activity sheet for kinder. 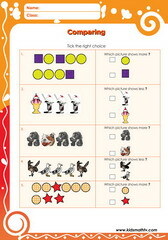 Left vs right positions spatial sense activity sheet for kids. 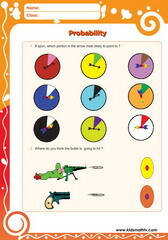 Learn about probability with wheels spinning randomly around a pointer. 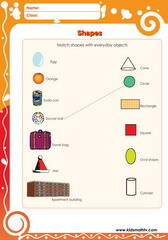 Relate shapes drawn to objects in real life. 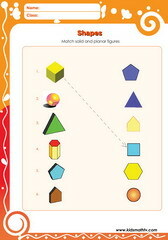 Good and practical way to learn geometry. 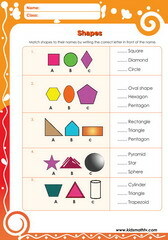 Geometry & Shapes worksheet for understanding shapes and spelling them. 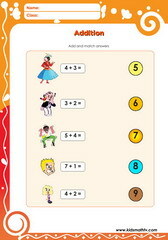 Relating solid & planar figures and matching with a ruled line. 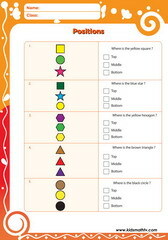 Practice Symmetry / Geometry with activities on this page. 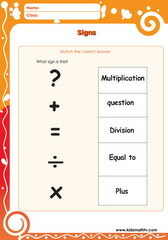 Print and share ! 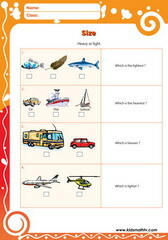 Which object is lighter, which is heavier - Light or heavy worksheet activities for kids. 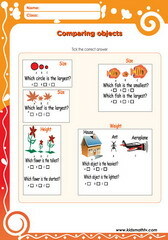 Size: which object is longer, which is shorter - math worksheet on dimension, size and capacity. 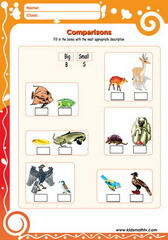 Practice sizes: tall vs short, Highly relevant activity for comparing objects in real life. 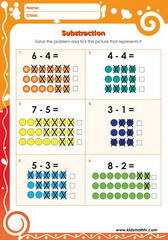 Subtract 1 from other numbers with dots up to 10 - Dots are meant to aid you. 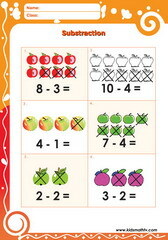 Practice Subtract one with pictures up to 10 with this worksheet. 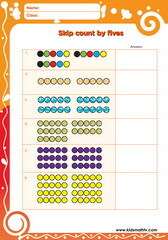 Practice Subtract 2 with dots up to 10 with this worksheet. 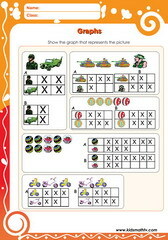 Practice Subtract with pictures up to 10 with this worksheet. Practice Subtract with shapes up to 10 with this worksheet. 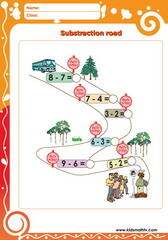 Learn subtraction in a real life bus stop game - numbers up to 10. 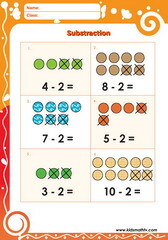 Practice Subtraction match to 10 with this worksheet. 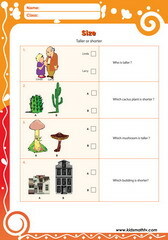 Practice Subtraction sentence with this worksheet. 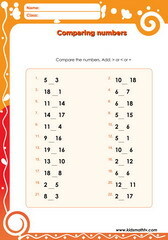 Practice subtraction of single digits numbers. 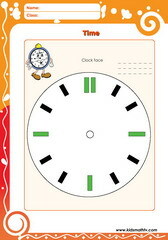 Learn how an analogue clock face works with this worksheet. 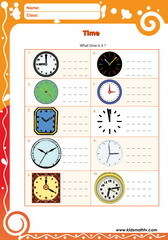 Practice reading time on analogue clocks - 1:00 o'clock, 2:00 o'clock etc. 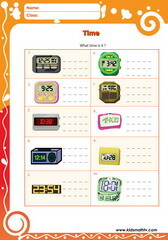 Telling time on analogue clocks - one o'clock, two o'clock, three o'clock etc. 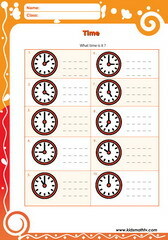 Reading time on electronic clocks worksheet for kids to start learning reading time basics. 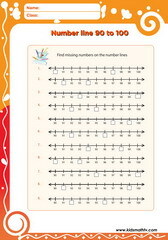 This page features kindergarten math worksheets in pdf printable format which teachers and parents can use to supplement their kid's course. 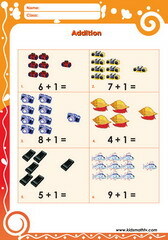 Each sheet has an illustrated dimension, combining colorful pictures and objects which clearly represent basic math concepts. 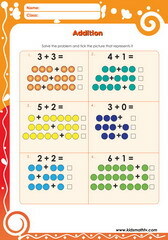 These worksheets cover the following topics: addition of numbers up to 10 with dots, comparing objects, geometry and shapes, telling time, patterns, fractions, counting and spelling numbers etc. 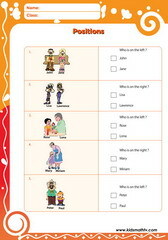 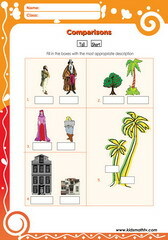 These worksheets can be used to make up free ebooks for children.